Where? 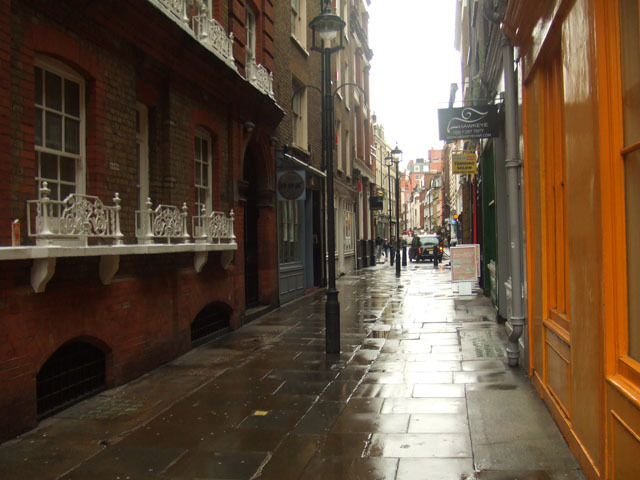 Sticking in Soho for another week, this little cutting will take you from Lexington Street to Hopkin Street. What? A rather anonymous alleyway, which seems to evade the attentions of the usual reference books. We're not even sure why it's called Silver Place; perhaps as a nominative . A number of markets have existed closeby over the centuries, so perhaps one of these specialised in silver. To the north-east, when the passage was called Pulteney Court, stood the Lion Brewery (1801 to 1937). The brewery played an important role in the history of public health. Many locals died during an outbreak of cholera in 1854. Dr John Snow theorised that this might be down to an infected water source - the Broad Street pump. One of the clinchers in his argument was the lack of fatalities amongst the brewery workers, who rarely drank anything other than beer. Snow thus became the first to demonstrate that cholera is a water-borne disease, the first step in eliminating it as a risk to public health. Why use? If you're an ageing bohemian and want to remain in Soho. Silver Place perhaps takes its name from the follicular hue of its denizens. To the south-east corner stands Pargiter Court - a residential block now used as retirement flats. A plaque notes that when the building was erected in 1886, the local vestry ordered the inclusion of iron balconies to 'encourage a taste for window gardening'. The ornate ironmongery can still be seen today.